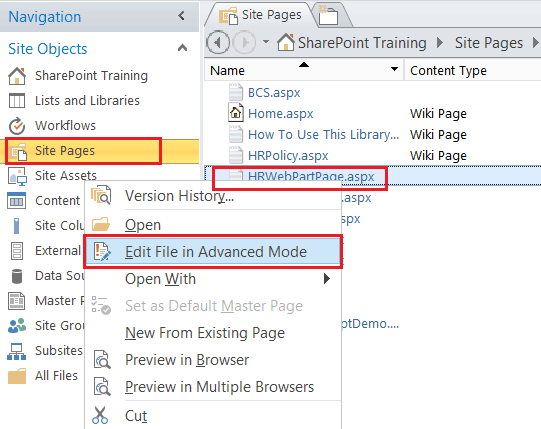 In this post, we will discuss how we can set the master page for a particular page in SharePoint Online. This will work also for SharePoint 2013 or SharePoint 2016. Recently we were working in a public facing site where we have created our own custom master page and we applied it throughout the site. If you are new to the master page then you can see an article on step by step tutorial on how to create a new custom master page by using an existing master page in SharePoint online. Also if you want to create a custom master page using visual studio 2013 for SharePoint 2013, you can follow this article. By default when you change the master page from Site Settings -> Master Page which is under Look and Feels. The master page will be applied to the whole site. But according to one of my requirement in one of the page we need to set the default Seattle master page. For this, we have to change the master page in the particular page by using the help of SharePoint designer 2013. Open the SharePoint site using SharePoint designer 2013. Let us say the particular page presented in the Site Pages document library then click on Site Pages under Site Objects in SharePoint designer. And then right click on the particular page and click on Edit File in Advanced Mode. Then save the page and refresh the page in the browser. You will see the particular page will use the Seattle.master page.